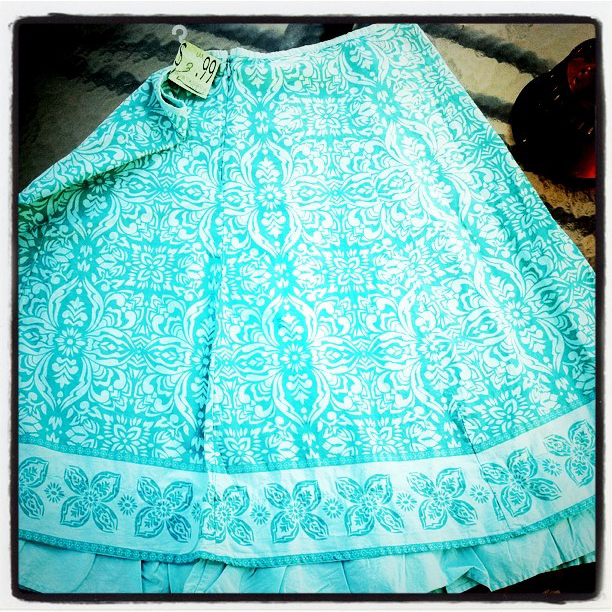 I went thrifting yesterday and I spotted this really sweet turquoise Sonoma skirt for $3.99 on the rack. I just couldn’t not take it home. It won’t fit me, but as I looked it over, I realized this could very easily be made into an apron. I love the clean country print with such nice touches at the hem. Easy Peasy! I love the color! I can’t wait to see the apron you create! Can’t wait to see the finished product! It is a great skirt, don’t know that I would have been able to pass it up either.